Lisa outlines the origins, history and purpose of the Jämtland sheep breed. That was the question by the former owner of Woolpower, a company that makes wool clothing in Jämtland county. At that point, Woolpower bought all their wool from Australia and South America. “Maybe we can breed a sheep that can produce wool so fine it can be used for materials against the skin”, he thought. This was the starting point of the project that led to the breeding of the Jämtland sheep, named after the county it originated. The Jämtland breed is a mix of the native Swedish Svea and merino. Svea sheep are themselves a mix of Texel and Finull breeds. Texel is a breed originally from Holland that was imported for the quality of its meat. Finull is an old breed that has very fine wool and is related to merino as there were merinos in Sweden in the 18th century. Finull literally means “fine wool” in Swedish. In 2004 the first merino studs were imported from Denmark. There were three studs and sperm from two other studs. All of the Merino Cormo breed, originally from Tasmania. The second round of studs came in 2009, when four merino studs were imported. They were all bred with Svea ewes which had been selected for having the finest wool. The Jämtland sheep breed was presented at the World Merino Conference as a new breed in 2010. A fully grown Jämtland stud weighs between 90 and 120kg, and the ewes 80 to 110 kg. Their wool usually has a thickness of 17-23 microns. The lower number, the finer wool. Merino usually has wool with under 24 microns, but there are variations that yield wool at “ultra fine” level from 12 microns. Now the interest for Jämtland sheep has increased even outside Jämtland county. Sheep-owners are impressed by this versatile sheep that gives very fine wool and good meat. More and more sheep farmers want to have Jämtland sheep and the wool is becoming well-known for how fine it is. But it has been more then eight years since the last merinos were brought in, and I’m hoping that a new initiative will be made to import more merino studs soon to ensure that Jämtland sheep keep having such fine wool. I agree with the former Woolpower owner. If we locally can produce a fine wool that we can wear it against our skin, why do we import wool from places so far away? In Sweden we only use 18% of the wool produced. The rest is thrown away since sheep farmers only make money from meat production. If more farmers kept Jämtland sheep, maybe that number could increase. And what about Woolpower who started this initiative? They never used the Swedish wool, and still import many tons of wool every year from countries thousands of miles away. 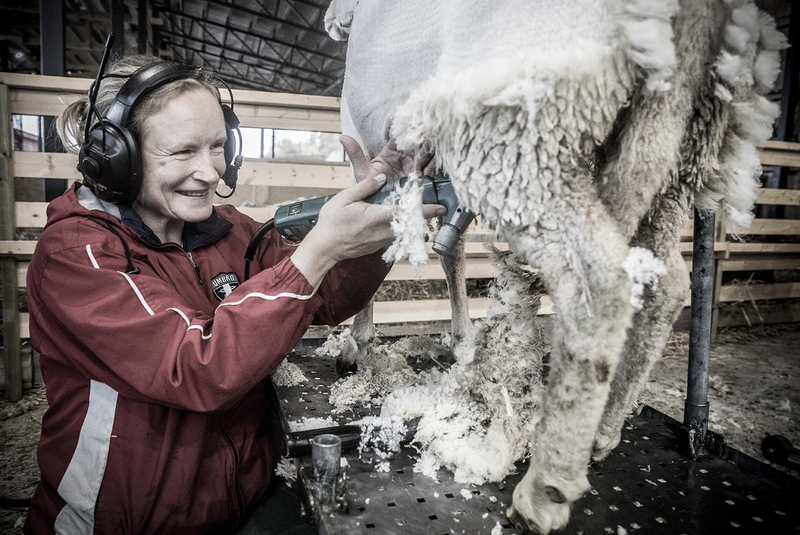 Carina Jälkentalo is shearing the Jämtland sheep.